Philippines: Geothermal Developer Launches Green Bond to Fund Renewable Energy Projects - The climate bond proceeds will contribute towards AC Energy's target of 5 GW of attributable renewable energy capacity by 2025 across the region. 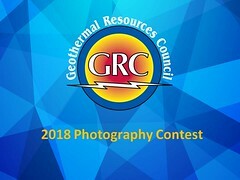 USA, California: Another Community Choice Aggregator Launches - Opportunity for Geothermal Energy Suppliers - Customers will be enrolled in GreenSource, SJCE’s default power service. GreenSource includes 45% renewable energy from solar, wind and geothermal and 35% carbon-free hydropower, and is 80% carbon-free overall. USA: Webinar Update from the Geothermal Technologies Office Announced - Q1 2019 Webinar (EERE/GTO) - Tuesday, February 19, 2019, 2:00 pm Eastern Standard Time (New York, GMT-05:00). Indonesia: Consultant Needed as International Geothermal Expert for Dieng and Patuha Geothermal Projects - The consultant, together with the National Geothermal Expert/Geologist, will support Asian Development Bank (ADB)’s due diligence efforts in connection with a potential debt financing for expansions of the Dieng and Patuha geothermal projects proposed by Geo Dipa Energi (GDE). Philippines: Geothermal Energy Companies Join Forces - AC Energy Inc. and Phinma Energy Corp. (PHEN) are set to sign a definitive agreement that will give the power arm of conglomerate Ayala Corp. a 51.48-percent stake in PHEN valued at P3.42 billion. USA, Utah: “There’s plenty of competition but in fact the [Geothermal Energy] market is fragmented and should be consolidated and optimised” - Cyrq Energy CEO - Utah-based geothermal energy company Cyrq Energy plans to develop 219 MW of projects in the near term to grow its footprint in a sector, which, CEO Nick Goodman - a GRC member - believes, needs consolidation. USA: Frontier Observatory for Research in Geothermal Energy (FORGE) Roadmap Released - The FORGE Roadmap outlines discrete research and development activities that could be carried out during FORGE’s five-year operation. Strengthening the understanding of the key mechanisms controlling EGS success could help unlock up to 500 GWe in the United States alone. Europe: Public Prefers Deep Geothermal Energy Projects Sited in Remote Areas - Study- Respondents rated their acceptance of four deep geothermal energy scenarios in an online survey (N = 814) conducted in Switzerland and Germany. Iceland: Six United Nations University Geothermal Training Programme Fellowships Announced - The selected have been offered a UNU-GTP fellowship to start their studies in late July/August 2019.